Markets are higher despite a lousy start to the earnings season. Bonds and MBS are down. Earnings season kicked off last night with Alcoa missing on revenues and revising down their forecast for aluminum demand. As if on cue, the IMF took down their global growth forecast for 2016 from 3.4% to 3.2%. Fastenal also missed this morning. Import prices rose for the first time since June of last year. Energy prices increased and food prices decreased. On a year-over-year basis, import prices are down over 6.2%. We will get two more inflation indicators this week, with the Consumer Price Index and the Producer Price Index. 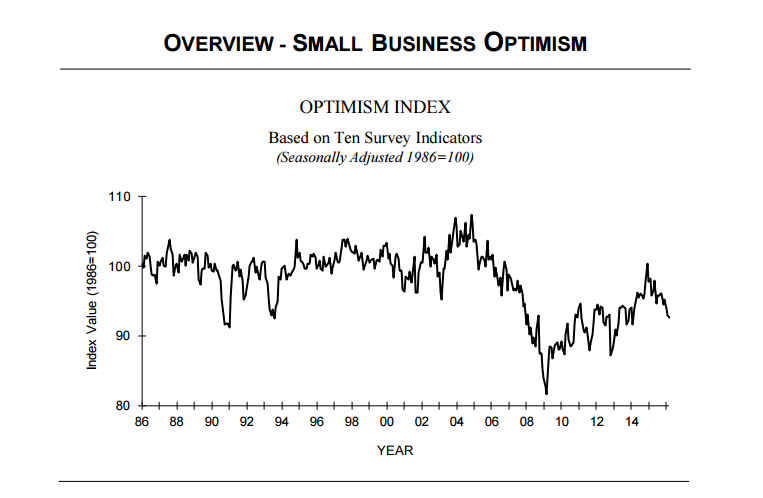 The NFIB Small Business Optimism index fell again to a two year low. The bright spot? Businesses are still adding employees, although there is a mismatch between the skills they want and the available labor pool. A net 22% of employers reported increasing wages. Capital expenditures are rising slightly, although it is tough to tell if that is merely maintenance capex or growth capex. Consumers are getting more pessimistic about the economy as well, according to Gallup. Voters are mad as hell, and they aren’t going to take it anymore. Completed foreclosures fell to 34k in February, according to Corelogic. This is a decline of 10% YOY. There are 434k homes in foreclosure, down 24% from a year ago. This is roughly where foreclosures were in late 2007. 1.25 million mortgages are seriously delinquent, which is down 20% from a year ago. Foreclosures remain an issue in the judicial states (especially in the Northeast) but aren’t an issue anywhere else. We are seeing delinquencies creep up in the energy states. Another day, another settlement with the DOJ. Goldman settled with the DOJ for $5.1 billion. I wonder how the fines stack up compared to the bailout money received. Frist! … That’s all I got. I don’t understand the uptick in import prices. Also, I don’t understand why there is so much anger when there is steady growth in the economy. It is not like 2008 by any stretch of the imagination, but people are angrier now than they were during the Great Recession. Is this fomenting rage a media creation? 24/7 bombardment of bad news, culled from everywhere? I am adding here that “liberal” and “conservative” rage both strike me as the same damned thing. If you are enraged and your daddy was a D or if you are enraged and your daddy was an R you are just plain angry, regardless of whether your focus is DC or NYC. I find our impossible to pay off debt and it’s inevitable massive economic impact that will occur in the next 15-20 years rather enraging. Someone did an article recently about that.. The anger isn’t directed at the economy – it is directed at the other party. I wonder how the fines stack up compared to the bailout money received. And, of course, the bailout money was paid back with interest. BTW…why should the government make $2.4 billion dollars from GS’s wrong doing? Certainly any investors that were defrauded or deceived deserve to be compensated, but why should the government receive any monetary award? BTW…why should the government make $2.4 billion dollars from GS’s wrong doing? Does Bernie really say screw the fines? I would have thought he would want the fines, too. His whole ideology is about confiscating money from people. But anyway, that is the correct answer. If the government can prove criminal activity, the execs responsible should go to prison. But any monetary damages should go to the victims of the fraud, not to the government. Otherwise it looks to me like little more than an extortion racket for government coffers. Don’t forget the government has a lousy track record in prosecuting financial executives. How long did they pursue Frank Quattrone before they gave up? The thing I find interesting is the BAC purchase of Countrywide. Basically all of the CW people were let go and have found new jobs in the industry. What exactly did BAC buy except for a liability stream? It must have been at gunpoint. Countrywide was BAC’s own stupidity based on what I’ve read. Merrill Lynch on the other hand was at gunpoint.